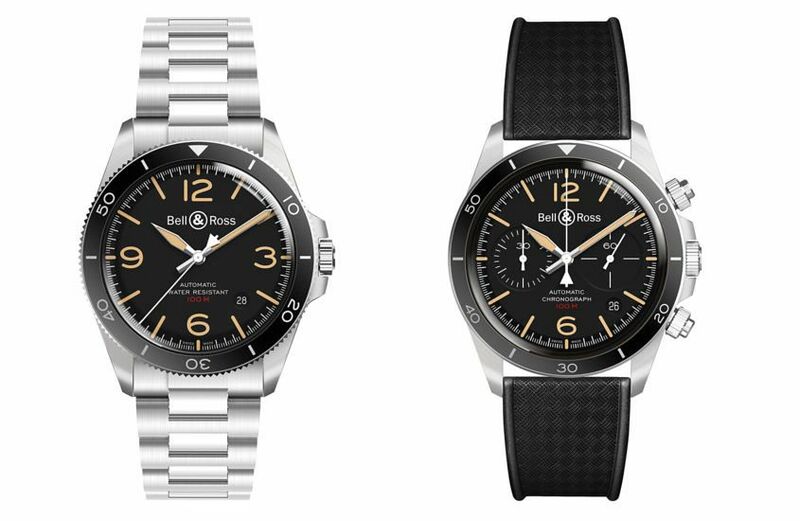 With aeronautical instruments remaining a main source of inspiration for Bell & Ross, it’s fair to say they’re passionate about aviation. And while we’ve come to expect flight-ready four-sided designs from the Parisian brand, last year’s third-generation Vintage collection not only evoked the look of instrument panels from aircraft of the 1960s but also featured a more classically styled round case. This year, as a preview to Baselworld, the collection has been given an update and an even stronger vintage feel with the release of two new Steel Heritage versions of the BR V2. They’re designed to meet modern military specs while also paying tribute to the best of days gone by. The three-handed BR V2-92 and the BR V2-94 chronograph now feature sand-coloured luminous hour markers and hands – a look we’ve seen in other collections from Bell & Ross – that recall the patina of aged tritium and add to the new-old charm of the collection. A red line of text for the printed 100m depth rating also replaces a previously white one on the dial. And the vintage theme is continued elsewhere with both versions now available on an old school-style tropic rubber strap – as well as the same reworked and finely wrought stainless-steel bracelet from earlier versions. Black dials and black bezels remain. However, the aluminium insert on the dual-register BR V2-94 has been switched from a tachymeter to a 60-minute scale. A more practical option that adds to the everyday functionality of the chronograph, as does the small circular date window that is neatly tucked away at 4.30 on both models. 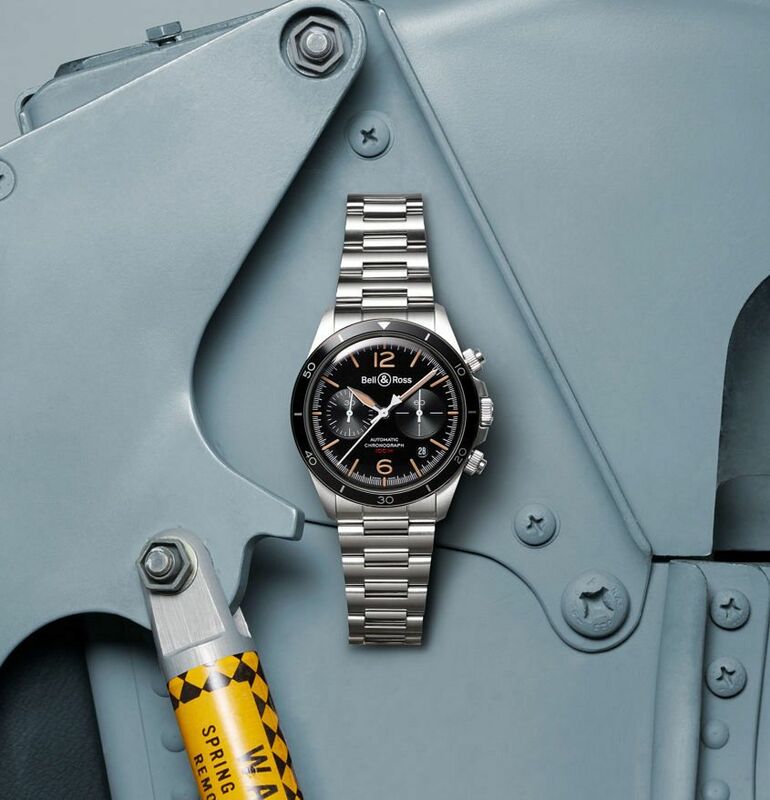 As before, stainless-steel cases are finished in a satin-polish and measure 41mm across with – like it says on the dial – a water resistance of 100m, thanks largely to screw-down crowns and pushers. And updated last year, the shorter and rounded lugs remain to better integrate the bracelet, while the case’s slim profile is balanced with the same ultra-curved sapphire crystal as before. Staying with what works, the BR V2-92 is powered by the BR-CAL.302 movement, the brand’s take on the Sellita SW300-1, with a power reserve of 38 hours. And the BR V2-94 runs the BR-CAL.301 chronograph movement, based on the ETA 2894-2, with a power reserve of 42 hours. Ever evolving, the Vintage collection reaches further back into the history of aviation while maintaining modern precision in a resolutely retro look. Want to find out more? Click here for more Bell & Ross.